The Mali-D71 display processor introduces the new CoreLink MMU-600 and Assertiev Display 5 units that enable the HDR10 color space and VR features at 4K resolutions / 120 fps. These chips should be launched with early 2019 smartphones. Smartphones and tablets are powered by system-on-chip modules that usually include CPUs like the ARM Cortex. This CPU is ubiquitous these days, used by Apple, Qualcomm, Samsung and most of the other SoC makers on the market. ARM also manufactures mobile display processors, Mali being its most powerful chip in this respect. The newest member in this class of processors is the Mali-D71, which also introduces two new IP blocks codenamed CoreLink MMU-600 and Assertive Display 5. The D71 processor comes with a totally new Komeda display architecture that enables [email protected] performance on mobile devices. The CoreLink memory management unit (MMU) works in tandem with the display processor to provide the necessary computational power for UHD content, while the Assertive Display 5 processor adds HDR and improved color gamut management. All three blocks were developed together in order to bring VR-ready compliance to mobile devices. Thanks to the new composition unit, the Mali-D71 can handle and scale more display layers, enabling multi-window features on Android. Moreover, the Assertive Display 5 chip is powered by the iridix8-HDR local tone-mapping engine that adds support for the HDR10 color space standard, Hybrid Log-Gamma and blue light filtering. 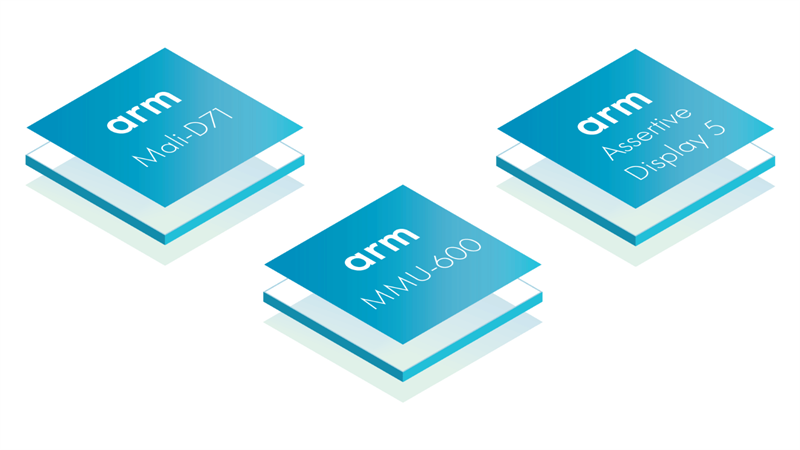 ARM is currently shipping the Mali-D71 together with the MMU-600 and the AD5 processor to select OEMs, and the technologies are expected to be integrated in early 2019 smartphone models.